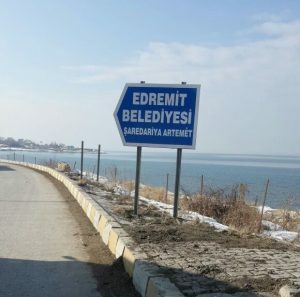 The new mayor of the Edremit district of Van province, who was recently appointed by the Turkish government in place of the democratically elected pro-Kurdish mayor, has reportedly removed all Armenian and Kurdish words from the a sign welcoming visitors to the town. 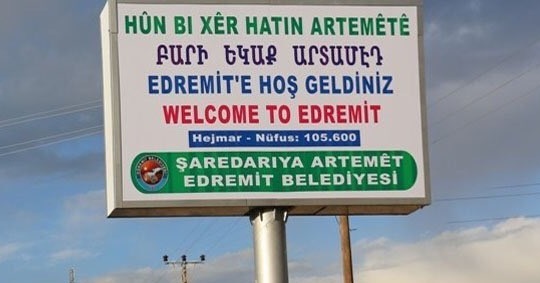 On the original sign, which was located at the entrance of the town, people were greeted in four different languages, including Armenian, English and Kurdish. However, the new sign now has only a welcome in Turkish. Turkey’s Interior Ministry appointed trustees to many municipalities in Turkey’s eastern and southeastern regions, replacing democratically elected pro-Kurdish mayors with government-appointed figures.